Address: 686830 Chukotsky АО, Chachunsky r-n, Pevek, Obrucheva st., 4/1, corp.2, off.14. 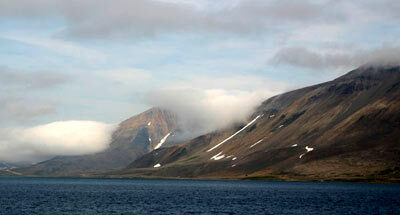 Zapovednik Ostrov Vrangelya, in the Arctic Ocean, was established in 1976. Its area is 2225,6 thousand ha, 795,6 being the terrestrial part. The Zapovednik is located on the Vrangel and Gerald islands on the boundary between the Eastern-Siberian and Chukotskoye (Chukchi) seas; the aquatic part comprises a 12-mile zone off the Vrangel and Gerald islands, except one site off the Vrangel shore from the mouth of river Khischniki to cape Havaya. The topography is mountainous, highly dissected. The Vrangel Island has about 900 lakes. The vegetation is that of Arctic tundras. Lower and middle parts of mountain slopes are occupied by grass-lichen, Dryas-grass-lichen, and, occasionally, shrub-forb tundras. In south-western and central parts of the Vrangel Island, relict steppe and tundra-steppe communities with a great diversity of flowers are widespread. There are sedge bogs with sphagnum moss, sedge-cottongrass bogs, thickets of elfin willows. On mountain tops are large numbers of rocks with rare spots of moss and lichen. The flora includes more than 300 vascular plant species, many of them are endemic and rare (Oxytropic wrangeli, Poa vrangelica, Papaver gorodkovii, Papaver lapponicum — listed in the Red Data Book of the Russian Federation). The fauna is not rich, no amphibian or reptile species are recorded. The common mammals are the Siberian lemming and collared lemming, polar fox (separate population). The red fox, wolf, wolverine, ermine appear repeatedly. In the offshore waters dwell the ringed seal, bearded seal, and there are walrus rookeries, which are the largest in Russia. In the sea whales occasionally appear, including the bowhead whale, killer whale, white whale. 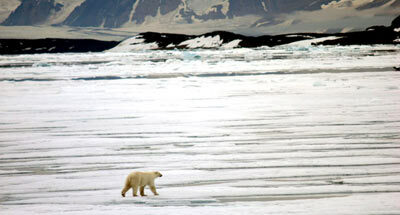 On the Vrangel Island polar bears assemble during the breeding season (the polar bear is listed in the Red Data Books of IUCH and the Russian Federation), where they make their dens. 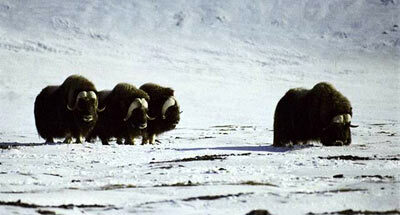 The musk-ox (Ovibos moschatus), domestic reindeer (Rangifer tarandus) were imported. 40 avian species are recorded. Bird colonies are characteristic (the background species are the kittiwake, pelagic cormorant, guillemot). The snow goose forms a nesting colony, which is the largest in Eurasia. Lapland longspur and snow bunting are numerous; the brent goose, eider duck, glaucous gull, robin sandpiper, and snowy owl have their nesting here. Little brown crane, Canada goose occasionally appear. 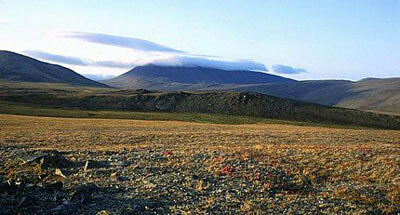 There are remains of paleo-Eskimo camps and dugouts of ancient Eskimos hunters are found.